Industrial Computer for security and protection of computer hardware, sealed to IP54 or IP65. 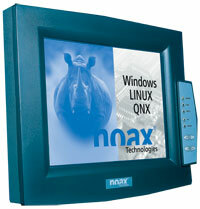 All noax C Series industrial PCs characterize themselves by their compact, mechanically robust and fully-enclosed design. The omission of ventilation slots, external fan and components susceptible to faults permit multifunctional use ï¿½ even in the most extreme production environments. The scope of application ranges from process data, machine data and personnel attendance acquisition, includes the machine control with process visualization, through to the mobile use in warehouse management or the building industry on a very wide range of carrier vehicles. As standard, the C Series IPCs are equipped with high-contrast and industrial TFT displays with very long-life that guarantee good readability even under the poorest conditions. The displays are available in 8, 12 and 15-inch diagonal sizes. The integrated, resistive touch panels also ensure simple and reliable operation ï¿½ even with protective gloves. Fault-tolerant, despite extreme environmental conditions Thanks to the fully achieved NEMA 4X (IP65) degree of protection, dust, dirt, moisture and splashed water cause no problem for noax industrial PCs. The heavyduty industrial components used in the noax products even allow their permanent use when subject to mechanical effects such as vibration or shock. If required, noax uses particularly shock-resistant flash- disks and special shock absorber pads.